Be tortured by onion tears no more! As you've undoubtedly noticed in the past, onions are equipped with a defensive mechanism. No, they don't have impenetrable, steel armour or spikes, but rather use a powerful, chemical weapon. Now, before you surprise Interpol with a telephone call to report your supermarket, let us clarify. A regular onion's cell-walls contain a lot of enzymes, called "alliinase" and "prensco." Normally, these enzymes will be neatly separated, but cutting the onions breaks down the cell-walls. The ensuing chemical reaction creates 1-propenyl sulfenic acid, which is then converted into propanethial S-oxide by the LF synthase enzyme. The onion thus releases a gas which penetrates your eyes and dissolves into tears. At that point, your tears will be made from a mild sulphuric acid. Your body counters this by producing even more tears to clean the acid out of your eyes. But no matter how elegantly you share this knowledge with your friends and family, it won't help one bit when your eyes are on fire. Today was the last day that your eyes were the victim of your love for onions! 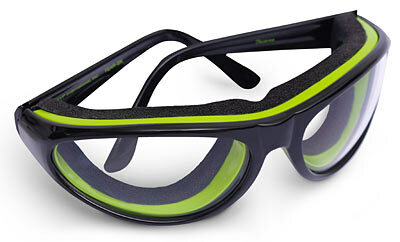 The sting in your eyes and the accompanying tears are a thing of the past with the Onion Goggles. 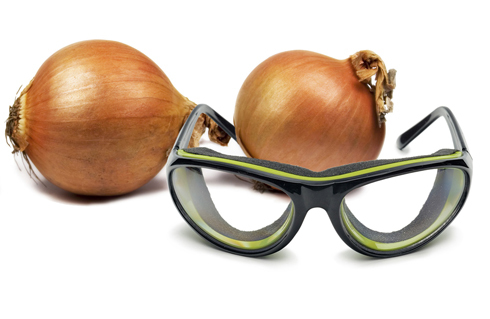 Put the Onion Goggles on your head and protect your eyes from the sulphuric vapours. Its model might not be suited for a walk down a Milan runway, but peeling onions will no longer be a kitchen chore from hell. And don't believe any of the old wives' tales: breathing through your mouth, lighting a candle, putting a cork between your teeth... they DON'T work. 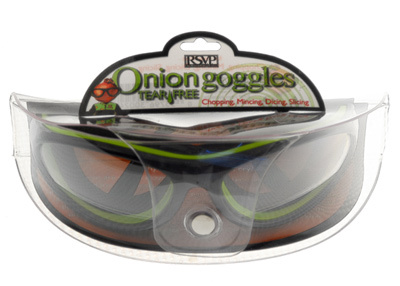 The Onion Goggles DO! Tears be gone, bring in the onions!